You can use pre-chopped almonds, but chopping them yourself yields a better tasting toffee. You can chop your almonds a week or more in advance. Use a food processor to chop all of the almonds. 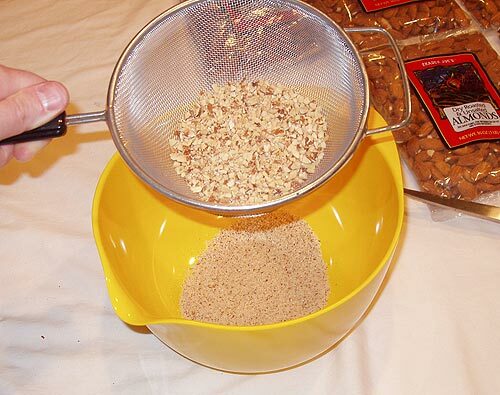 To reduce the risk of scorching and improve the consistency of the almond coating, use a coarse sieve to filter out the fine almond powder. Discard the powder or save it for a recipe calling for almond flour. Store the almonds in an air tight container until ready to use. 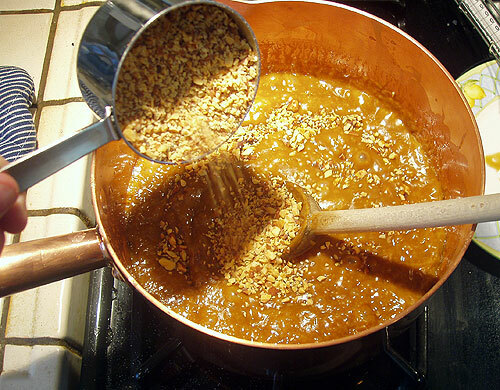 Cook the toffee mixture minus almonds until it reaches 260° F (127° C). Melt the butter in a copper pot until melted. 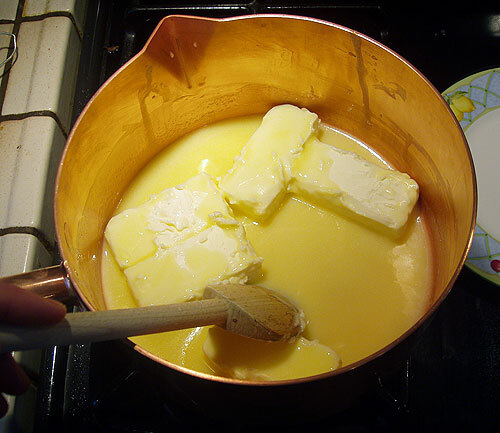 Melt the butter slowly over low heat—if the butter separates into fat and clarified butter there is a good chance it will never come back together (this is bad). It is tempting to just turn the heat on low and walk off to do other things; keep an eye on the melting butter and stir occasionally (or more). Add the water, sugar and salt and increase heat to medium. Cook until the mixture registers 260° F (127° C), stirring constantly. This will take about 15 minutes or more. If you don't have a television in the kitchen, you will really give it some thought at this point. Very warm toffee will not break nicely, so let it cool before trying to break along score lines. 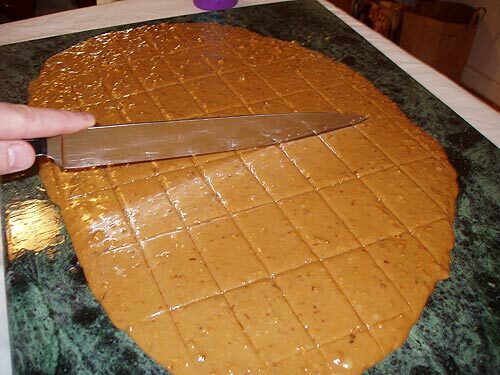 If you have another surface you can transfer the toffee to you can slide the toffee there to cool as the marble board will retain heat and slow cooling. Using the knife, carefully separate the toffee from the marble until you can pass the knife under all the toffee. 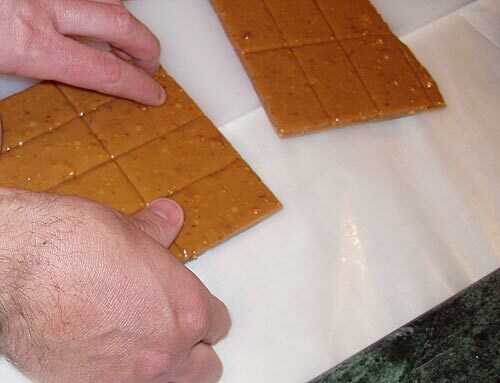 Slide the toffee onto the other surface, being careful not to bend the toffee. 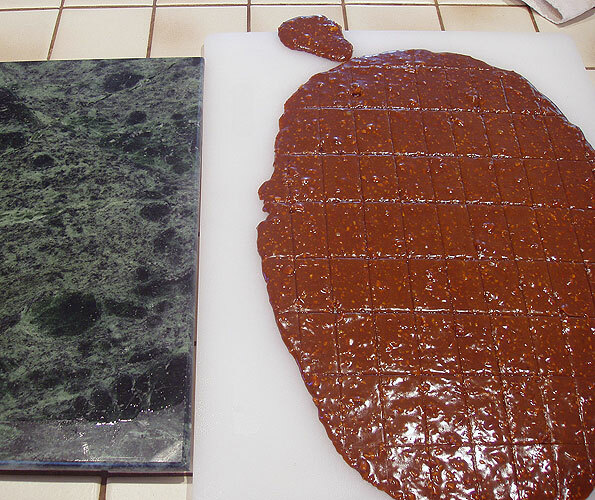 I transfer the toffee to an oiled plastic pastry board, but you could also just move it to a cool spot on marble counters (it is probably harder to slide the knife underneath all sides with marble countertop—this is where the raised marble board is nice). 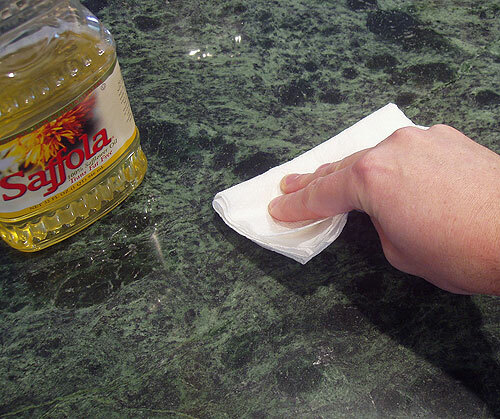 If you are using silpat, then you can just keep moving the mat around to cool spots on your counter. You don't really use all the almonds called for in this recipe, but you will need them to line the jelly roll pans and to facilitate coating chocolate enrobed toffee. Lay a drop cloth on your counter or workspace and set up your chocolate enrobing and almond coating workstation. 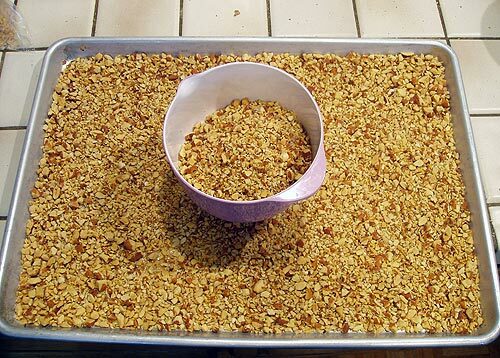 Toffee will go from dipping to laying in a bed of chopped almonds before having more almonds drizzled on top. It can get messy. See the related technique on tempering chocolate for how and why to temper your chocolate. 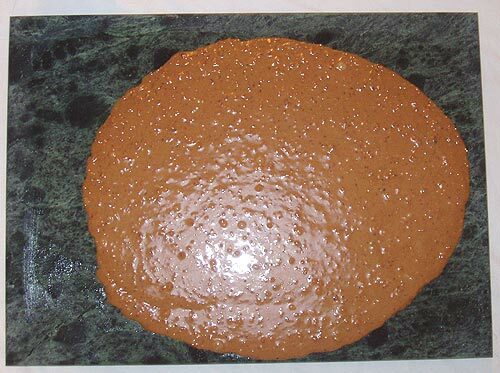 Since you are coating your toffee with almonds over the chocolate, you can actually be a little sloppy with the tempering, but with poorly tempered chocolate the almond coated toffee will need to cool much longer in the almond-lined jelly roll pan before they can be stacked or handled roughly. I have too much candy to make, so I just use a tempering machine rather than fret over chocolate tempering. 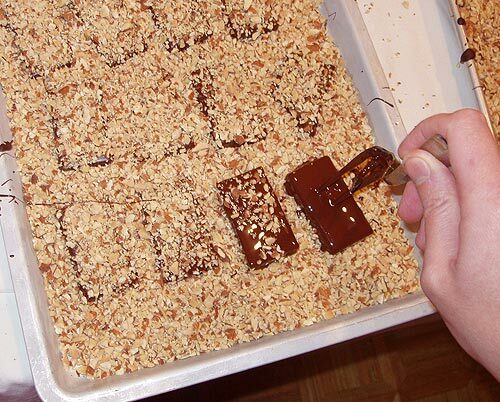 Dip the pieces of toffee and lay them in chopped almonds. Coat tops with almonds. Dip the toffee pieces in your tempered chocolate and transfer to the waiting bed of chopped almonds. I'll usually lay 3 or 4 pieces down on the almonds before grabbing a handful of almonds and gently drizzling the almonds over the pieces in the same order they came out. You should drizzle the almonds on the pieces just before the chocolate sheen goes satin and the chocolate sets. Too soon and the almonds will pull drag the chocolate off the sides of the pieces. Repeat until the jelly roll pan is full. You can then transfer the jelly roll pan to the fridge or a cold room. If you went overboard on the almond chopping, you should have plenty to line another jelly roll pan with, otherwise you must wait for the other toffee to harden enough to permit transfer to another location—an airtight container, ideally. Store in airtight container at a cool temperature. Storing in the refrigerator is not necessary unless you really want to store it for one or two months. Freshness is key, so consume within 2 weeks for the best taste experience.